The 2m and 70cm machines are linked together, providing cross-band 2m-70cm/70cm-2m operation as well as the normal 2m-2m and 70cm-70cm operation. 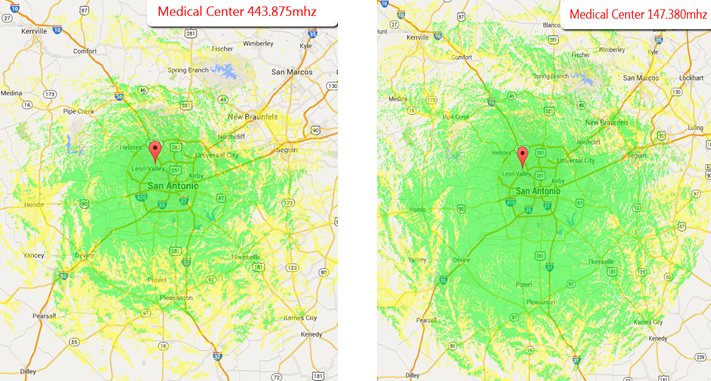 The 2m and 70cm repeaters are manufactured by Bridgecom Systems and have a 100% duty cycle rating at a full 50 Watts. NOAA Weather Radio Alert is automatically rebroadcasted on the 2 meter side of this system when severe weather alerts are issued. The 33cm Repeater is a custom build repeater with a 30 watt PA designed by Tom Apel, K5TRA that is linked to a nationwide All-Star Network.